Thus says the LORD: I know their works and their thoughts, and I come to gather nations of every language; they shall come and see my glory. I will set a sign among them; from them I will send fugitives to the nations: to Tarshish, Put and Lud, Mosoch, Tubal and Javan, to the distant coastlands that have never heard of my fame, or seen my glory; and they shall proclaim my glory among the nations. They shall bring all your brothers and sisters from all the nations as an offering to the LORD, on horses and in chariots, in carts, upon mules and dromedaries, to Jerusalem, my holy mountain, says the LORD, just as the Israelites bring their offering to the house of the LORD in clean vessels. Some of these I will take as priests and Levites, says the LORD. Brothers and sisters, You have forgotten the exhortation addressed to you as children: “My son, do not disdain the discipline of the Lord or lose heart when reproved by him; for whom the Lord loves, he disciplines; he scourges every son he acknowledges.” Endure your trials as “discipline”; God treats you as sons. For what “son” is there whom his father does not discipline? At the time, all discipline seems a cause not for joy but for pain, yet later it brings the peaceful fruit of righteousness to those who are trained by it. So strengthen your drooping hands and your weak knees. Make straight paths for your feet, that what is lame may not be disjointed but healed. Tapos na ang mga bagyo at sungit ng panahon kaya't walang masungit dapat sa mga nagsisimba. Panahon lang ang masungit, hindi ang mga nagsisimba. The other day, after the floods and the rains, a friend sent me a picture of his room via Facebook. He was so happy and very proud of his accomplishment. I was surprised to see that, because if you had been to his room, his room was a mess. You could hardly move around. You could hardly open the door. Pag naglakad ka doon dapat patagilid, kasi bukod sa maraming gamit, makalat din siya. But then, he was so proud to say that these past few days na walang pasok, he cleaned his room. He did not just re-arrange things; he was jubilant in sharing that he sent almost half of his stuff to Caritas for the victims of the typhoon. And that is why when he showed a picture of his room, it was so clean, it was so clear, it was wide. Pwede na siyang mag-jogging sa loob ng kwarto niya. Pwede na siyang magtatakbo dahil lumuwag 'yong dati rati'y masikip. Kailangan lang palang linisin. At hindi lang basta linisin....kung kailangang ipamigay ang mga dapat ipamigay, ginawa na niya. At dahil doon, lumuwag ang lahat. I remembered that incident as I was reflecting for today's Gospel. In today's Gospel, we heard Jesus saying, "Strive to enter the gate of the Kingdom..." But the gate is narrow. Masikip ang lagusan sa Kaharian ng Diyos. And when we perhaps heard that - masikip - some of us perhaps panicked. Some of us perhaps got nervous. 'Naku, narrow pala. Baka hindi tayo makapasok....Masikip pala, baka hindi tayo makasama.' We might panic, so much so that like the man in the Gospel, we might ask the Lord, "Lord, kung masikip pala, will only be a few saved?" We are afraid, because for us, narrow is something negative. Narrow is not nice. Narrow is a source of panic. Kaya nga palaging may lumalapit sa akin, "Father, pwede po bang luwagan n'yo na 'yong bridge dito sa Greenbelt Chapel? Nakakatakot po pag may emergency, walang makakadaan nang maayos." Kaya ipagdasal n'yo po. Nakahain na po 'yong appeal doon sa Ayala na luwagan na ang bridge natin. Kasi nga nasa isip natin, pag masikip, delikado, nakakatakot. But it is not really the purpose of the Lord. Was the Lord frightening us when said the gate to the Kingdom of God is narrow? What does it mean? What does it imply when Jesus says 'the narrow gate of the Kingdom'? Mayroon po sana akong ipapakita sa inyo sa screen, pero may kaunting problem sa USB. Bibigyan ko sana kayo ng test sa traffic sign. Noong nag-a-apply po ako ng driver's license, sabi nila, mahigpit. Lumapit sa akin ang proctor, sabi niya, "Father, perfect na kayo, huwag na kayo mag-exam, tutulungan ko kayo. Pag mayroon kayong hindi alam, Father, itanong n'yo sa akin." Nakakahiya naman, naturingang pari po ako. And I sat there in the room, only to find out na naka-post naman pala doon sa pader ang lahat ng traffic signs. (laughs) So ang sabi ko, walang babagsak talaga. But there is a sign that perhaps most motorists and drivers would know. It is the sign which symbolizes 'narrow road ahead'. When you see that sign - 'narrow road ahead' - what do you do? What is your instinct? Sa mga nagda-drive, you will slow down. You will drive carefully, because the road is getting narrower and narrower. And I believe that is what the Lord meant when he said 'the gate is narrow'. It is to remind us that in the journey of life, you must be careful. You must be vigilant, you must be alert. Di ba? 'Yong mga pumupunta sa Baguio....'yon ang problema sa ibang driver, nagre-relax, porque alam nilang sanay na sanay na sila. Doon nag-uumpisa ang trahediya. Pagpunta sa zigzag, pag makipot na ang daan, ayaw pa ring bumagal. Kaya nakakalungkot at nagkakaroon tayo ng mga aksidente. Today, Jesus reminds us that the road to life, the road to God is narrow, to make us more alert, more careful...for us to know the important directions. You do not just disregard what you are passing by, because a wrong turn, a simple neglect, can cause a major disaster. The road to life is narrow, because Jesus wants us to be alert...to know what is important. Secondly, the gate is narrow, not wide. Elsewhere in the Gospel, Jesus said, "The road to the Kingdom is narrow, the road to destruction is wide." Ano daw po 'yong isang consequence kapag masikip ang daan? Tulad po dito sa bridge ng Greenbelt Chapel....if you happen to attend mass here during the afternoon of Sundays, you will realize the narrow gate. Naghihintayan 'yan. Di ho ba 'yong Commonwealth tinawag na killer highway? Bakit? Pag maluwag, paspasan. Pero pag masikip, napipilitan tayong magbigayan. Kaya po pag Sunday ng hapon, pag palabas na muna ang mga tao, wala munang papasok. When the gate is narrow and the bridge is narrow, people have discipline. People tend to think of others, not just themselves. There will never be a mob. There can never be a selfish crowd. There is consciousness for the other. And that is also what our Lord would want us to realize. That is why in the Second Reading, we heard in the letter to the Hebrews, God is the Father of discipline. We do not like to be disciplined. But we all know, we need discipline. Discipline purifies us; discipline expands our hearts. The road to God is discipline. When we are suffering, when we are being challenged, look at it, not as a punishment from the Lord. Look at it also as God distilling our soul...God purifying our soul. Just like the narrow gate. Di ba ngayon po nakakatuwa...nakikita natin na may pila na, may disiplina na, at dahil doon, mayroong pagmamalasakit sa isa't isa. The road to God, the road to life is narrow, so that we may learn to love our neighbor. Lastly, the gate is narrow....maganda po sana may ipapakita akong picture sa inyo. May isang tao, marami siyang dala, naka-kotse pa siya. Pero nakita niya 'yong gate, hindi ho siya pwedeng pumasok na kasama 'yong kotse niya. Hindi pwedeng kasama 'yong mga gamit niya. Kasya lang para sa kanya. And that is also what our Lord would want us to realize. The road...the gate to the Kingdom is just enough for us. Not our stuff, not the unnecessary things of life, not the treasures we think we could bring. What is enough is ourselves, our hearts, our lives. When Jesus says the gate is narrow, He did not say we could not enter. Tayo pong lahat, pwedeng pumasok. Pero may mga bagay sa atin na dapat nating iwan. Hindi natin pwedeng bitbitin. Ini-imagine ko na 'yong mga excess baggage. Tayong mga Pilipino, sikat na sikat. Mahilig tayo sa excess baggage. Pero pagpunta po sa langit, bawal ang excess baggage. Tayo lang ang pwedeng pumasok. At ang tanungin natin, baka 'yong kamay natin, ang daming excess baggage, pero 'yong puso natin, ang gaan-gaan, dahil walang laman. Baka 'yon po daw ang dapat lamnan natin....'yong puso natin, 'yong kalooban natin, 'yong kaluluwa natin.....kasi, 'yon ang makakapasok sa langit. Jesus is saying that the road to God is narrow, because He wants us to focus on what matters most in life. And so, as we continue with this mass, let us ask the Lord for that grace. Lord, remind us always that the gate to Your Kingdom, the door to Your house, the passage to Your heart is narrow. But this is not to discourage us, not to frighten us, but Lord, to purify us. To teach us what matters most in life. To make us more loving and selfless to others. A few years back, a woman approached me. She was crying, and she told me, "You know, Father, I had a miscarriage. I just buried this fetus. And I named my baby 'Hope'." She approached me because she said, "In my prayer, I imagined my baby. The baby that I wasn't able to meet, that I wasn't able to know, that I wasn't able to have in this earth....And in my prayer, I told her, "I'm sorry that I never got to know you." The lady said that after that, she had peace. "I'm sorry, I never got to know you." Brothers and sisters, I hope that at the sunset of our lives, the moment we pass from this world to the next, I hope we will never tell Jesus, "I'm sorry...I never got the chance to really know you." Because that would mean we will never enter the narrow gate...we will never be part of the Kingdom. 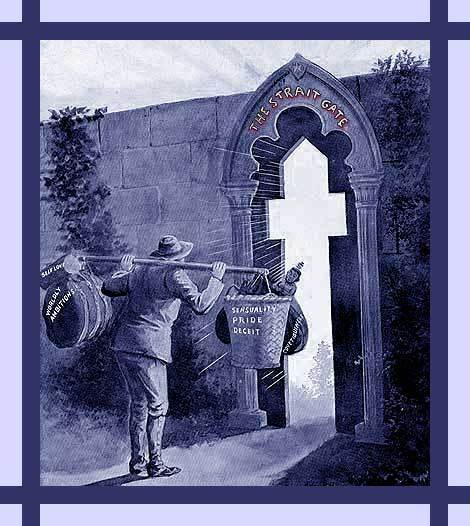 Entering the narrow gate ultimately means knowing Jesus in our lives. And when I say knowing Jesus, hindi lang 'yong alam natin ang pangalan ni Hesus. Hindi lang 'yong alam natin na ang nanay niya ay si Mama Mary. Hindi lang dahil nagsisimba tayo, kaya natin Siya kilala. Pero sana, kilala natin si Hesus, taos sa ating puso. Kilala natin Siya bilang isang kaibigan. Sinusunod natin Siya bilang Panginoon. Minamahal natin Siya bilang Diyos. So that at the end, we could say, "Lord, I truly know You." And you will hear Jesus say, "Enter the Kingdom of God." Amen.